What Is the Purpose of a Tatami Room? A tatami room is a fixture in washitsu, or traditional Japanese interior design. 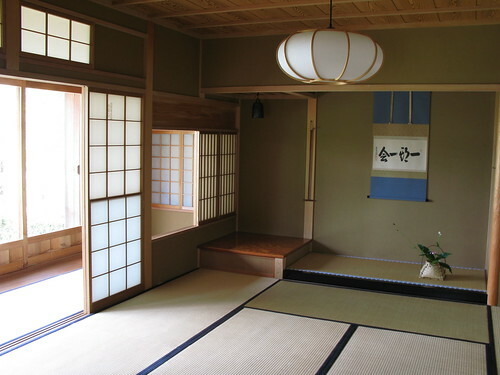 Once the mark of nobility, modern tatami rooms serve as study areas in temples and as living or sleeping areas in homes. The tatami room, with its simple furnishings and open atmosphere, can bring the Far East into any Western home. Modern tatami rooms make excellent yoga and meditative spaces. The Japanese word tatami traces its origins back to the verb "tatamu," which means to fold. Traditionally woven from rice straw, tatami mats were 3-foot by 6-foot pads that Japanese men and women sat or slept on to make resting on the floor more comfortable. Mats were often folded or stacked when not in use. Dating as far back as the 8th century, tatami mats were a symbol of social status. Only the wealthy could afford to rest on tatami mats, while commoners were forced to sit on the bare floor. Aside from the traditional mats, a tatami room features a low ceiling, futons or cushions for furniture, rice paper blinds and thin privacy screens called shoji, instead of walls. As tatami rooms grew in popularity and more people were able to afford them, some designers began using multiple tatami mats to cover the entire floor in a manner similar to carpeting. Modern mats are made of more durable materials and are easier to clean than rice straw. They are still not recommended as floor coverings in high-traffic areas, however, and you should not place furniture on top of them. The open feel of a tatami room is meant to provide relaxation and peace of mind. In traditional Japanese culture, a tatami room often served to entertain visitors, conduct tea ceremonies or house a religious altar. The room's airy design, straw mats and simple decor also helped alleviate the heat of humid Japanese summers. Today, tatami rooms are often used as living rooms or sleeping quarters. Some are also used as yoga studios or meditative spaces, thanks to their airiness and minimalist furnishings. Respect for tatami mats started the tradition of removing one's shoes before entering a tatami room. The mats are so ingrained in Japanese culture that, even today, many apartment and housing advertisements list room sizes based on how many tatami mats will fit in the room.